Girls can be super heroes too! 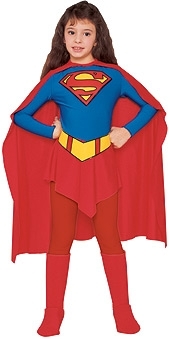 This Supergirl costume comes with a cape, and jumpsuit with attached boot tops and belt. For details of sizes, see sizing chart. Size: Medium - Out of StockLarge - fewer than 5 available for next day dispatch.